To mark European Week Against Racism, Irish political parties stood united today in their renewed commitment to racism-free election campaigns. As the Dáil chamber lay empty during the spring recess, representatives from every political party, and independent candidates, were invited to cast their political differences aside to sign the Anti-Racism Election Protocol. 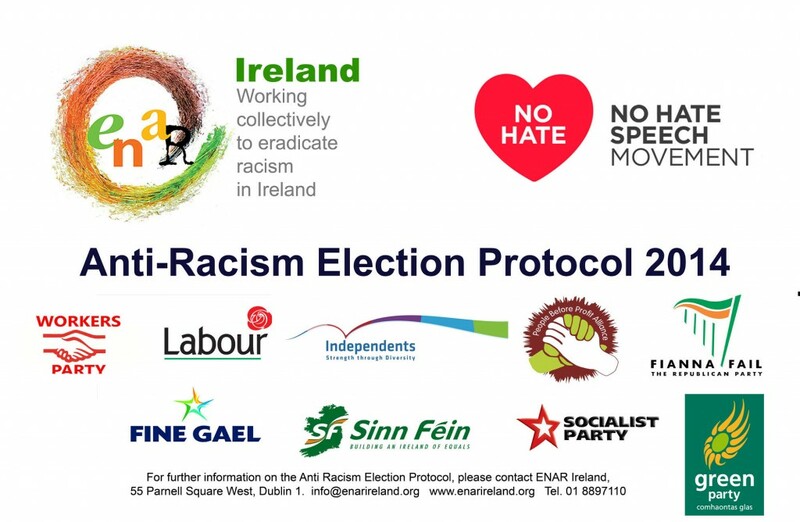 The Protocol, re-launched today by ENAR Ireland, the national anti-racism watchdog, has played an important role since 2001 in ensuring that elections have been conducted in such a way that they do not incite hatred or prejudice on the grounds of ‘race’, colour, nationality or ethnic or national origin, religious belief or membership of the Traveller community. ENAR Ireland extended this invitation to parties and candidates so that they can demonstrate and renew their commitment to anti-racism. Party General Secretaries and Justice Spokespersons from Fine Gael, Labour, Fianna Fáil and Sinn Féin have been invited to attend, along with independent candidates and representatives from People Before Profit, the Socialist Party, the Anti-Austerity Alliance and the Workers Party. ENAR Ireland coordinates a network of over 40 civil society organisations working in anti-racism in Ireland, and is the Irish coordination of ENAR, the European Network Against Racism. ENAR Ireland and ENAR work to coordinate common civil society led responses to racism and racial discrimination at a local, national and European level. ENAR Ireland operate www.iReport.ie, the independent national racist incident reporting tool. iReport.ie was launched on 11th July 2013 and is a human rights monitoring tool, which takes the form of quarterly and yearly observations on racist incidents in Ireland. The iReport observatory compiles its data from information submitted by people who have been subjected to racism, by frontline anti-racist organisations and other organisations that are committed to combating racism, and by the public. You can read the latest report here. Galway: Mon 24th March, ENAR Ireland in conjunction with the Galway Traveller Movement officially launches www.iReport.ie and the Anti-Racism Election Protocol in Galway. Pádraig Conneely, Mayor of Galway, will be speaking at the event at 11am, Galway City Council Office.